Finland is rightfully known as one metal’s most productive countries, and one of the genres it excels at is melodic death / doom. Six piece Marianas Rest are a relatively new act in the field, having put out their debut Horror Vacui in 2016. Whilst not groundbreaking, it was well received, and provided a stable foundation for the creation of Ruins, the group’s second effort. The term ‘melancholic’ has been thrown around in a lot of the promotional materials I have seen for this album, but it never really struck me as such, or at least not in the traditional sense. There’s little of the slow burning, funereal gloom that is typical of doom bands, and overall, things just sound a bit too pleasant. It’s more of a bittersweet feel than anything, with the somberness balanced by a sense of hope and positivity. This is not detrimental to the overall quality of Ruins, but those wanting a purely morose affair may want to approach with caution. 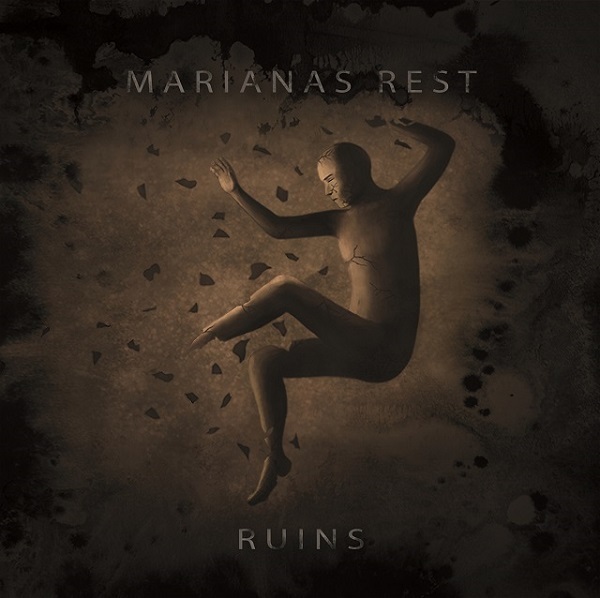 That said, Marianas Rest do dig into their bleaker side on occasion, and the opening moments of “Kairos” are steeped in sorrow, with a lone cello accompanying a spoken word intro. A burst of moderate blasts and fiery tremolo riffs dispel the depressive haze, before routinely switching with passages of simple melodies and harsh vocals in a solid yet predictable fashion. A fair start to proceedings, and improvements are immediate with “The Spiral”, a well calibrated doomster that pits sparse verses and whispers against hanging, monolithic chords. “Hole in Nothing” and “The Defiant” takes things in heavier and brisker directions respectively, before “Unsinkable” proves to be worthy of its name; a wonderfully executed, riff driven number that has the sort of melodic textures that only a Finn could muster. “Restitution” is of a similar ilk, again carried by stout riff work, dual harmonies and an alluring bridge fraught with a lingering danger. These songs highlight another issue with the ‘melancholic’ tag – Ruins is at its best when the pace picks up, and it’s a lot harder to sound downbeat and desolate when you get as lively as Marianas Rest do. There’s something about the musicianship here that irks too. Quite a lot of the guitar lines fall into straightforward chord progressions, displaying a lack of imagination and variety too often for my liking. Whilst it is one of the best components of their sound, when used as a safety net this much, it can become trite and formulaic. It’s not a huge problem if the songs themselves are really strong, but that is not the case here. These guys have good chops, but the riffs don’t showcase it enough. Jaakko Mäntymaa’s vocals are also very hit and miss. His conviction cannot be questioned, and at times he’s downright beastly (the aforementioned “Unsinkable” and the cavernous crusade of “Omega” fine examples); conversely, there are a number of occasions where his throat sounds impoverished to the point where it’s cringeworthy (“The Defiant”, “Shadows”). I can’t be too downbeat on Ruins, despite its shortcomings. The songs are generally well crafted, the production helps bring the music to life, and they manage to stir up quite an atmosphere (even if it’s not what they seemingly intended). They’ve still got a way to go to match the consistency and creativity of genre leaders like Swallow the Sun and Insomnium, but the talent is there. If you’re a fan of said bands, you could do worse than give Marianas Rest a shot. Ruins is available on April 26th via Inverse Records, and can be purchased here.